After a slight delay, my oversized parcel of gaming posters made it here from the States this week. 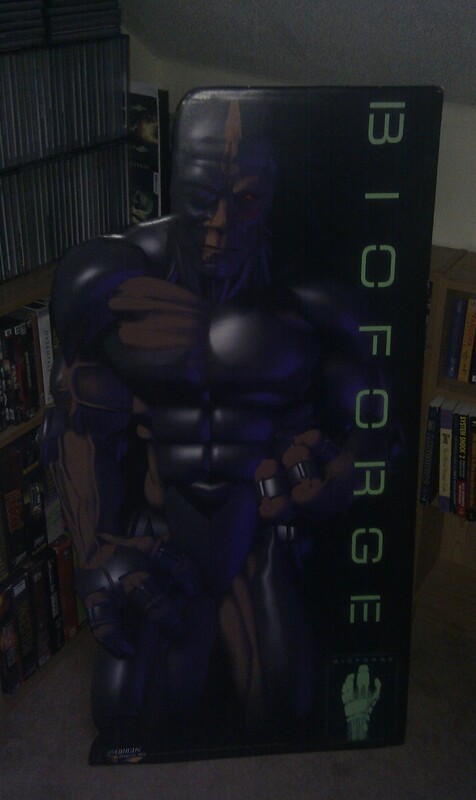 I won’t share the lot now but here is a Bioforge standup advertising display which would have been used in stores back around 1995 when the game originally came out. This is made of thick cardboard and about 4 foot tall with a built-in stand at the back. Origin did these standups for several of their games around this time. Keenan Weaver posted his Crusader one among all sorts of other cool Crusader memorabilia a week ago over at Echo Sector. There is also a photo of the WC4 standup art available from here on wcnews. That’s all the standups that I’m aware of. If anyone has or can point me at photo’s of any others, I’d love to see them. I have a spare one of these Bioforge standups by the way which is up for grabs at a price if anyone wants it.